Digrand – One Page Portfolio Template And Blog Created by owl-themes. This templates have specific characteristics, namely: Digrand is a new and basic portfolio template that perfectly suits any type of business websites. It doesn’t matter what type of business you have: a Finance, Consulting, Banking, Freelance, Corporate, or an Industrial. Digrand is exactly what you . 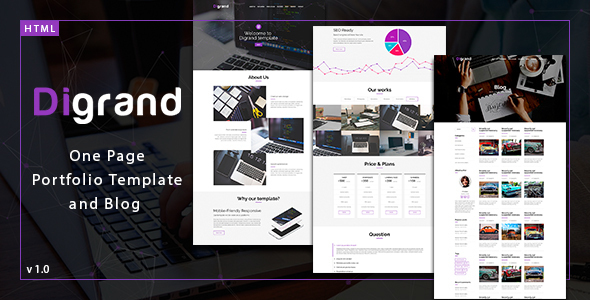 You can use this Digrand – One Page Portfolio Template And Blog on Site templates category for blog, business website, consulting, corporate, finance, financial, graphics, marketing, portfolio, presentation and another uses. Digrand is a new and basic portfolio template that perfectly suits any type of business websites. It doesn’t matter what type of business you have: a Finance, Consulting, Banking, Freelance, Corporate, or an Industrial. Digrand is exactly what you need. The HTML files include a working contact form, a news page, about us page, services, video area and many more. Creating your own personal page is incredibly simple, because Digrand has all the elements a business needs. This template is a perfect fit both for small and large business portfolio. It has various outlines and it’s created to take your company to the next level. If you have any difficulties with the installation process please contact us and we will answer all your questions. Digrand includes a one-page HTML template, as well as various options for blog pages. There are three variants of the site – Purple, Blue, Green. The template is compatible with all current browsers. Ajax Contact Form – a working feedback form.